Supreme Court Chief Justice John Roberts speaks at Belmont University in Nashville, Tennessee, February 6, 2019. 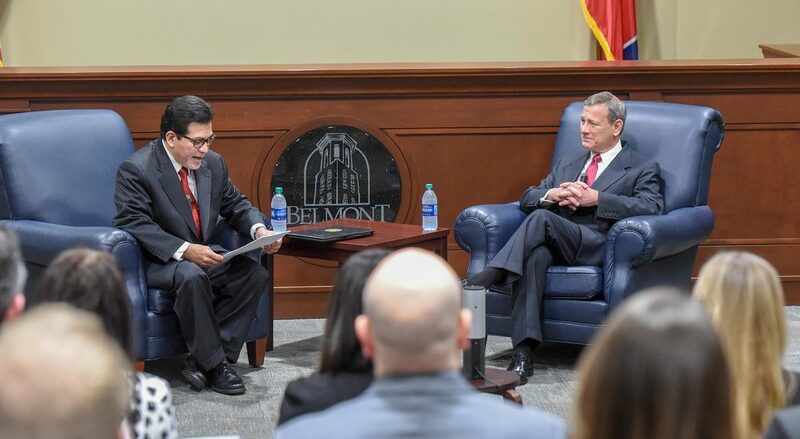 The Honorable John G. Roberts, Jr., Chief Justice of the United States, participated Wednesday in a 45-minute conversation with Belmont Law Dean Alberto Gonzales in Belmont’s Baskin Center. Judge Gonzales, the former U.S. Attorney General, led a discussion with the Chief Justice in front of an audience of Belmont Law students, invited dignitaries and local judges. Roberts’ wry humor permeated the event as he and Gonzales engaged in a conversation touching on life inside the Supreme Court as well as Constitutional law and the legal practice in general. Questions for the discussion were submitted by Belmont Law students and faculty. The interview opened with a question about what it is like to be the Chief Justice of the United States. Chief Justice Roberts has served as the Chief Justice of the United States since 2005. He received an A.B. from Harvard College in 1976 and a J.D. from Harvard Law School in 1979. He served as a law clerk for Judge Henry J. Friendly of the United States Court of Appeals for the Second Circuit from 1979–1980 and as a law clerk for then-Associate Justice William H. Rehnquist of the Supreme Court of the United States during the 1980 Term. Chief Justice Roberts’ visit marks the second time a sitting U.S. Supreme Court Justice appeared at Belmont Law, following Justice Samuel Alito’s address at the inaugural Belmont Law commencement in 2014.